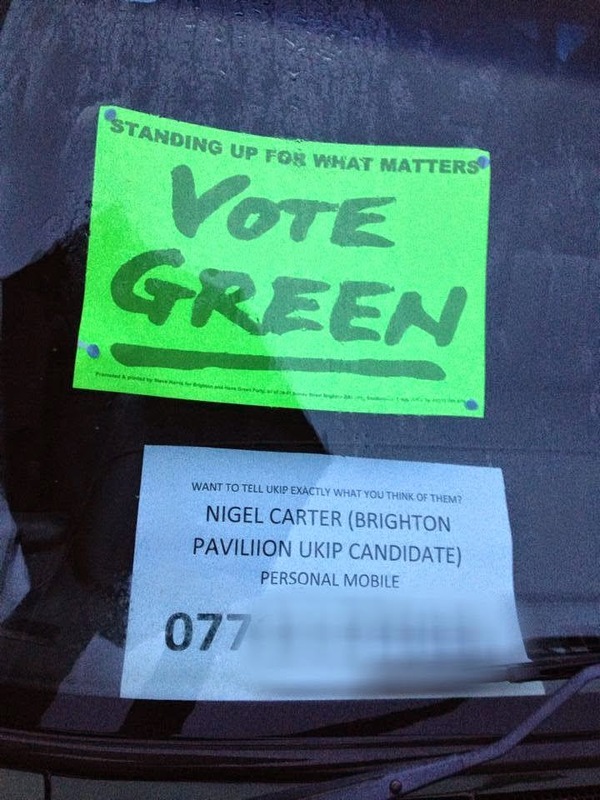 It is unclear whether this is officially anything to do with the Green Party, or whether its appearing next to a "Vote Green" flyer is just a coincidence; I have contacted the Green Party, their leader Natalie Bennett, and their candidate in Brighton (their former leader, and only MP from the 2010 Election) Caroline Lucas for a comment on this via Twitter, but have so far had no response. What is clear, however, is that somebody is spreading the personal phone number of the UKIP candidate in Brighton, and inciting people to use it to threaten or intimidate him (what other meaning – before anybody argues that point – of "Want to tell UKIP exactly what you think of them?" could there reasonably be?). But no matter how much you disagree with somebody's ideology, this kind of personal intimidation is simply beyond the pale. Spreading somebody else's personal contact details without their consent is harassment and abuse, and disliking someone's political views does not make that OK. Whether this is the work of the Green Party, or their supporters, or just somebody working alone, if they can't separate the personal from the political then maybe they should stay out of politics entirely.